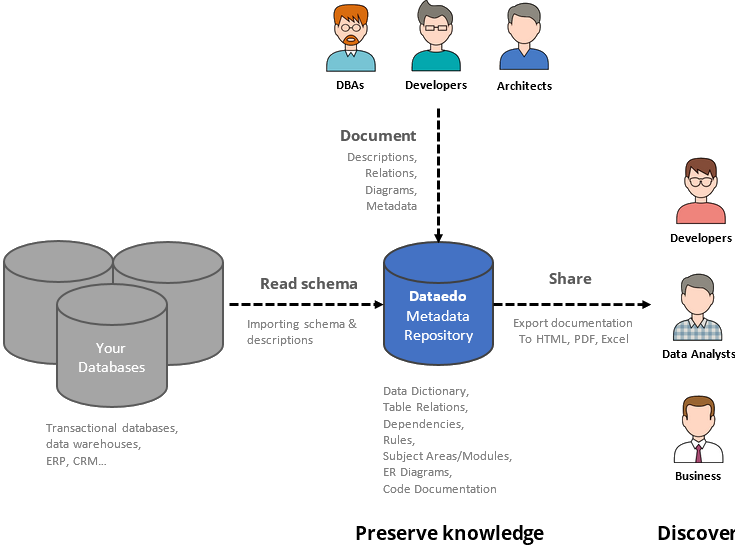 First step is to connect to your database and import schema to Dataedo metadata repository. Now to the documentation part. You can provide a description (and additional metadata) for each schema object and element (table, column, key, stored procedure, etc.). You can also complete data model by with missing foreign or unique keys. This information will be stored in the repository. For better understanding of large databases you can spit them into smaller subject areas called modules. Define list of modules, and for each provide a description and assign database objects. For each module you can visualize physical data model with an ER diagram by dragging & dropping tables and views to the pane. You can share your documentation in interactive HTML, nicely formatted PDF or Excel. Whenever schema of your database changes just click Update button (or schedule automated task) to import them to your documentation without fear of losing any of your descriptions. Development and documentation of databases is a continuous process and Dataedo is designed to support that with features like importing changes, automation with command line or tracking documentation progress. "We use Dataedo to document multiple databases and our data warehouse. Dataedo helped us save a lot of precious time."